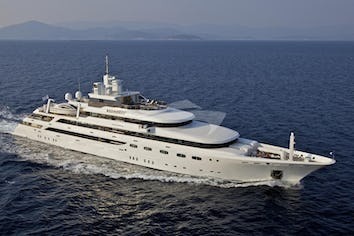 Built by renowned German shipyard Lurssen, Horizon III's quality and level of engineering is remarkable. Designed by Espen Oeino, she has an elegant exterior design with a white superstructure and distinguished blue hull. Her Northern European pedigree is apparent, and Horizon III is for sale in immaculate condition. Launched in 2008, the 70.1m (230ft) steel and aluminium motor yacht Horizon III was built to Lloyd's classification and is MCA compliant. She has a rich classic interior by Francois Zuretti with impressive joinery worth over EUR 16 million alone, and this is accompanied by exquisite details such as gold accents, marble flooring, onyx counter tops, silk carpets and custom furniture. Horizon III has seven luxurious cabins accommodating up to 18 guests. The split-level master suite is a stunning escape, with its own private observation lounge providing 180-degree panoramic views. Her opulent interior is also wonderfully spacious, offering multiple options for relaxation and entertaining. 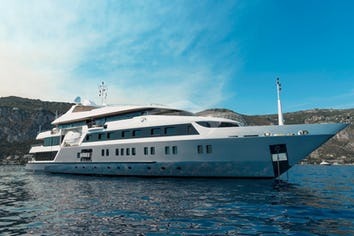 Horizon III boasts a cinema, a gymnasium, several bars, a large pool deck, state-of-the-art audio-visual and communication systems as well as a glass elevator serving four decks and a private observation lounge. Horizon III's extensive exterior deck areas and voluminous 1,940GT interior make her the stand-out 70m Northern European on the market. Horizon III is equipped with a wide variety of tenders and toys, including scuba equipment, wave runners, a limousine tender, kayaks and more. 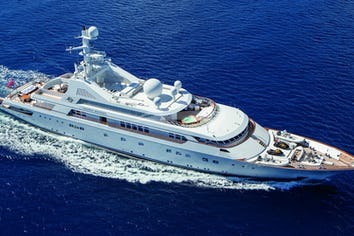 With vast storage for provisioning and a range of 6,000nm, she is ready for self-sufficient far-flung cruising. Kaleidescape central server with touch screen Crestron controls to access the wide selection of movie & music libraries. Elevator from accommodation deck to Sports Deck. KING. Full width Master Suite. DINING SALON: Dining table seats 12/14. Dining salon can be fully-enclosed. Crew service entrance via pantry to dining salon ensures guest privacy. Tender garage/lazarette: Enclosed, air-conditioned garage for all tenders and watersport equipment. Fresh water shower and powder room for guests. Dining table seats 12/14. Built-in stern seating full width with 2 occasional tables, wet bar to port w/ 5 stools, additional built-in seating to starboard with 2 occasional tables. Large flat screen TV. Under arch: Large U-shaped wet bar / 12 stools.